dentures I new dentures in just one week! new dentures in just one week! Most denture wearers have found that having new teeth can be a very long and drawn out affair which usually involves endless trips to the dentist that are often spread over many weeks. but at dentureshop everything happens under one roof. At dentureshop we've simplified everything and our dentists, CDT's and technicians all work together during every stage and our patients meet the whole dental team. Patients can explain their requirements, expectations and concerns to the actual technicians who are creating their dentures...we are finding that this very direct line of communication guarantees the best results every time. and because it's a dedicated denture service we can keep the costs down and offer exceptional value for money. Simply call 0113 279 6667 for your FREE consultation. 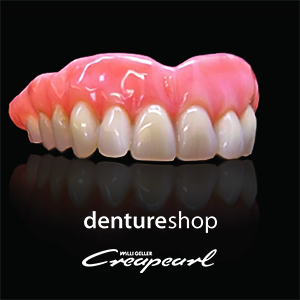 All dentures supplied by dentureshop are manufactured in our on-site laboratory to an exceptionally high standard. 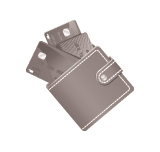 We only use the highest quality materials and different options are available to match individual needs and budgets. 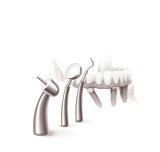 Generally, the more expensive the option is chosen, the more lifelike and durable your denture will be. The difference in price between the options reflects the additional clinical and technical skills involved and the quality of the materials used. At dentureshop everything is menu priced and there are no hidden costs. There are several options to choose from to suit all budgets and everything is menu priced. 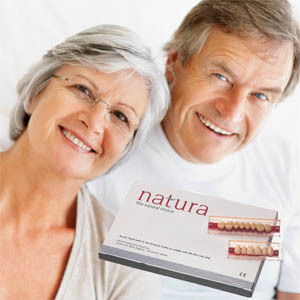 Our natura denture is our `entry level` option, and this denture is featuring well proven Schottlander natura teeth and a high quality `standard` strength acrylic base material to provide an affordable high-quality denture. Natura anterior teeth use skillful shading, internal mamelon effects and a subtle response to changing light conditions to achieve their remarkably lifelike appearance. Natura posterior teeth, with natural translucent cusps, are exceptionally strong and durable in the mouth and there is now a five year guarantee card available. 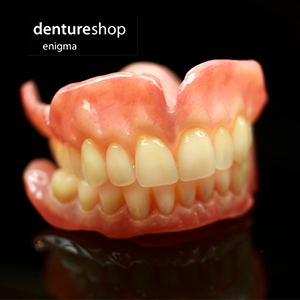 The enigma denture is a stronger and more convincing option. enigma teeth have additional characterization which means that they look more natural-this is especially relevant for partial denture wearers when the denture teeth need to perfectly match existing natural teeth . This denture includes Lucitone high impact denture base material which is 6 times stronger than standard acrylic. This super strong denture is ideal for patients with a history of denture fracture or when a denture opposes natural teeth. Part of out ultimate range this denture features ` Ivoclar` denture teeth which are generally regarded in the industry as being some of the most lifelike available. 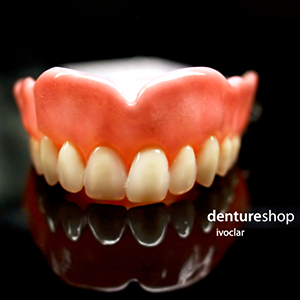 This denture is constructed by senior technician using superstrong high impact base material which is then hand stained, fully contoured and customized to mimic the natural characteristics of natural soft tissue . This really is our top of the range denture and it is different because it features full size teeth (all other denture teeth have undersized molars and premolars-probably to save time and materials) which means that this denture functions more like natural teeth. The Creapearl denture tooth was developed by Swiss master technician Willi Geller and each Creapearl tooth is a hand finished work of art. Creapearl teeth are the most lifelike and convincing denture tooth available. ...this option includes fully contoured, hand tinted and superstrong high impact acrylic…and is a must for the discerning denture wearer. Partial Dentures are more complicated to make than full dentures. They usually involve extra stages in the surgery and additional laboratory work which is why they are more expensive. 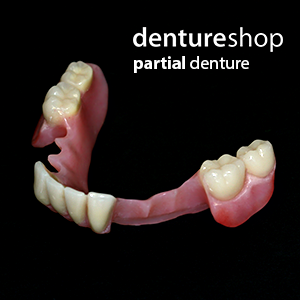 As a standard feature all of the partial dentures made at dentureshop are produced in high impact acrylic. A cobalt chrome framework is often a healthier option for partial denture wearers. A chrome framework connects onto and around existing teeth to hold the denture firmly in place. Cobalt chrome dentures are more secure and they usually allow areas of the palate to be exposed which is healthier for soft tissue in the mouth. A cobalt chrome fitting surface or palate can sometimes be used to provide strength and stability to dentures for patients with a strong bite and a history of denture fracture. 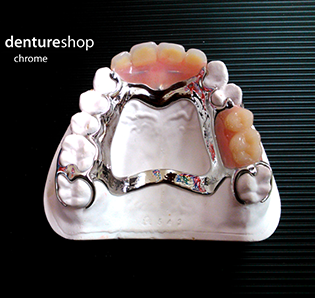 Chrome based dentures can be made ultra thin for people who struggle with the feeling of `bulky` dentures. Flexible or `valplast` dentures are made out of an unbreakable nylon based material which is much stronger and more flexible than acrylic. This innovative type of denture can be made out of very thin base material which adapts with the constant movement in your mouth. Valplast flexible dentures fit comfortably and securely around your existing teeth and the high translucency of the base material helps the denture blend in seamlessly. Some denture cases are complicated and require special treatments-we are able to provide all kinds of denture solutions including advanced loose denture and spongy palate treatments and we can even manufacture our own custom made denture teeth to match existing `hard to match`dentition-these services are charged for on a `time spent` basis. These costs will always be discussed before we start your treatment. 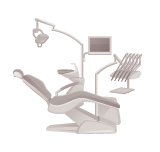 At dentureshop there are never any hidden costs. Due I need an appointment or can I call iin anytime to discuss new partial dentures?I have a phobia with Dentists go every 6 months but my own Dentist takes too long to make Dentures. My 22 year old daughter has a palate with 2 false teeth on it (incisors). one of the teeth broke off while she was on holiday. A paramedic there told her to superglue it as a temporary fix.She is getting a replacement with her current NHS dentist but it is taking so long and the tooth, which is in a very prominent position, is always breaking off and she is having to re-glue it. would you be able to fix the existing palate quickly? Of course, we have an while you wait repair service starting at £25. She can call 0113 279 6667 or just drop in. Also I would recommend she will ask about a flexible new denture which we produce in just one week. do you exstract teeth so ican have dentures. dentureshop. All rights reserved. designed by purple orca	Unite Theme powered by WordPress.